Armstrong-Alar Chain Corporation carries wire rope in Galvanized IPS, and Stainless Steel T304 & T316 in many different diameters and tensile strength. The base principle of a wire rope is several strands of galvanized IPS or stainless steel surround a core of fiber or steel in a spiral encasing the core and strengthening the rope. The most common wire rope consists of six strands surrounding a fiber or steel core. Wire rope can be manufactured in several materials like steel, iron, stainless steel or galvanized IPS (Improved Plow Steel). Wire ropes consist, essentially, of three components including the wires, the core, and multi-wire strands. 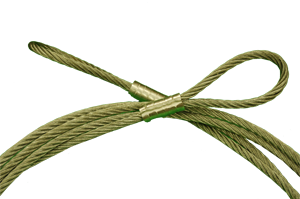 The braided core is in the center, then the wires surrounding it are also wrapped or braided as well, then those are wrapped and braided around the core material. The wire rope has high tensile strength and durability because the braiding causes the wire rope to be dense and less susceptible to fraying. Our 6x19 Class wire rope has 15 to 26 wires per strand depending on use and weight lifting requirements. The 6x37 Class wire rope has 27 to 46 wires per strand. Both wire rope configurations are available in fiber core and IWRC (Independent Wire Rope Core) types. So if you are looking for wire rope for sale for a particular project or to stock for resale, contact Armstrong-Alar Chain Corporation today and get more information on our wide selection of chain, slings, wire rope, hardware, safety equipment, and more. Just fill out our easy to use contact form on the right of the page now to get started.